Old Testament - Today in Leviticus chapter 13 we read about contagious skin diseases and mildew. Quite a chapter. It does make sense to me that this level of detail is given by God on these topics. These instructions were health instructions for the community of Israel as a whole. Zondervan's commentary notes that "the ceremonially unclean were excluded from the camp (the area around the tabernacle and courtyard), where the Israelites lived in tents. Later, no unclean persons were allowed in the temple area, where they could mingle with others." I look at this from the standpoint that they did not have medicines back then to heal people of these contagious diseases - and as such, the only way to keep the diseases from spreading to the entire population was to isolate the sick. I know this doesn't sound compassionate on the surface... but was there a better option at that time? In the New Testament we read about Jesus curing people of leprosy, which was thousands of years later. It's obvious that skin diseases were a major issue in Moses' day and through Jesus' day - as was mildew during Israel's rainy season of October through March - particularly along the coast and by the Sea of Galilee where it is very humid. Matthew Henry's Concise Commentary on Leviticus chapter 13 begins at this link and you'll see a few "Next Commentary" links at the bottom of each page to take you through the chapter. On a side note, leprosy is still in existence in our world today, though at much lower incidence rates than ever before. It is a sad disease to learn about... I did a google image search on the word leprosy and was pretty shocked by the pictures. The World Health Organization's website says this - "Today, diagnosis and treatment of leprosy is easy. Essential work is being carried out to integrate leprosy services into existing, general health services. This is especially important for communities at risk for leprosy, which are often the poorest of the poor and under-served. Full control of leprosy has eluded mainly in some parts of Angola, Brazil, India, Madagascar, Mozambique, Nepal, and United Republic of Tanzania." More info on leprosy in our world today is at the World Health Organization's website at this link. New Testament - Today in in Mark Chapter 6 verse 4 we read – “Then Jesus told them, "A prophet is honored everywhere except in his own hometown and among his relatives and his own family.” I guess what this verse reminds me of is that sometimes when we really move forward in our faith, our friends (“hometown” from the verse above) and our relatives can sometimes not understand what on earth is going on with us. I think there are phases of our walk with God where really it becomes very personal – between us and God – and through that process God will often transform us. And our friends and relatives may not appreciate our change – just as Jesus’ friends and relatives did not appreciate his ministry in this verse. I just hope that this verse can be of comfort to you if by chance you are having challenges at times reconciling your faith and your changed heart with your friends & relatives expectations of who you were in the past. Know that you are on the right path. As long as you are staying focused on God and his will for your life, you may have to accept some loss of “honor” (per the verse above) in your status with your friends and relatives. You may not seem to be as “cool” or “fun” as you once were in your friends’ eyes. But – if in God’s eyes you are loving Him with all of your heart and you are loving your neighbors as yourself, then you are eternally cool and fun in the Kingdom of Heaven. And that’s where it really counts. Where are you truly seeking “honor” in your life today? In the eyes of your friends and relatives – or in God’s eyes? Commentary on Mark chapter 6 is at bible.org at this link. Psalms - Today in Psalm 39 verse 5 we will read – “My life is no longer than the width of my hand. An entire lifetime is just a moment to you; human existence is but a breath." This verse is a powerful verse for each of us to meditate upon as well. How does this verse speak to you? Do you feel like life moves fast sometimes? If so, how are you spending your time? Are you being intentional about how you invest your time? Are you being intentional about your work? Your friends? Your finances? Volunteering? Serving others? Loving others? Watching TV – or not watching TV? (Have I gone off on my “Kill Your Television” soap-box yet this year?… J I’ll save it for a future post…) If life really is “but a breath” – are you spending your breath wisely? With your breath are you constantly loving God with all your heart and loving your neighbor as yourself? Proverbs chapter 10 verse 10 is a great reminder that in the long run it is so much better - more peaceful - to stand up to an injustice or wrong. We should not let things slide. I think this can apply to our own lives as well. If we know we ourselves are doing something wrong, we should not just "wink" at our wrong. But we must reproof it and confess it and let Jesus heal it. mike, i found todays section on leprosy quite challenging. part of my work is to help people with skin problems overcome associated psychological difficulties - in fact i have just finished a six week group. two of the big issues are how other people perceive them (scabby, dirty) and the social isolation they can impose on themselves / others impose on them. i must say i found matthew henry's commentatary particularly unhelpful as it seems to reduce skin conditions to just something visited on people by God and then tries to bring Jesus into it by the back door when he was never hinted at in the pasasge - i am happier with your ideas about 'better the exclusion of one than the illness of the whole nation'. the bible is after all inherently practical. I was moved by the verses in today's Psalms regarding the brevity of life. This is mentioned in other books in our Bibles as well, it just touched me today. Am I using my brief time here well? I shall close for now and pray about that. One of the things that we must be careful of is dismissing things as irrelevant or unnecessarily out of date and out of touch with “modern times,” everyone thinks, whatever the time period is, they are in modern and sophisticated times. May I ask Rob to hold off on any judgment of what this “isolation” meant to the community of Israel and the people involved. “Leprosy” (as per King James) of the skin, clothe, walls of the house (to be read at a later date) represented “sin,” which not only causes someone to be isolated from the community, if known about, but isolates and isolated us from God. Remember God’s way is not our way nor are His thoughts the same as our thoughts. God provided in His covenant with His people, Israel, healing; and because we have not all taken hold of that healing doesn’t mean we are any worse off then any other believer. What I’m afraid of is that we are in danger of shaping the Word to fit our perspective of life when we read something that either doesn’t make sense to us or doesn’t fit our vocation, job or chosen life style, molding and shaping the Word based on a personal perspective. Father God I ask that the veil of misunderstanding be lifted from our spiritual eyes and ears so that we will see the way You look at life, that we will see life from Your point of view. In Jesus’ might and glorious name, Amen and Amen. I am not a doctor, nor do I play one on television, but I believe that the separation mentioned in Leviticus in our reading today has sound medical reasons, not social ones. It helps to remember that there is a difference between the Law that God gave Moses, and the legalism that the Pharisees of Jesus' day practiced. Ramona, I'd like to offer my observation that Moses in this passage is not talking about sin, he is writing down the distinctive hygiene and medical directives that God handed to his people Israel. These were way ahead of their time in other cultures and in marked contrast to the gentiles surrounding the Jews at that time. There may be some underlying principles beneath the verses in this passage, but I would hesitate to spiritualize the text and miss what God was actually saying. Rob, I agree with your concern about people simplifying these diseases by declaring that they were a "punishment" from God on certain people. My God is a God who heals and who protects his people. That's who I see in Leviticus, not a God who inflicts disease on his people and then castigates them, throwing them out of the fellowship of the congregation. I read very specific medical descriptions of the sores, the skin and the hair surrounding it. I read the diagnosis and the treatment prescribed. I read almost as much about being pronounced "clean" as being pronounced "unclean". This sounds like a program for health, not for condemnation. Mark 6:12,13 Then they were on the road. They preached with joyful urgency that life can be radically different; right and left they sent the demons packing; they brought wellness to the sick, anointing their bodies, healing their spirits. -- This is the heart of God, this is the message of God's kingdom, this is the mission of God's church. Mark 6:18-20 For John had provoked Herod by naming his relationship with Herodias "adultery." 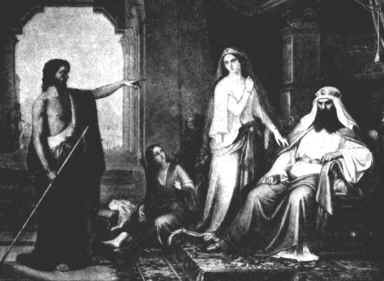 Herodias, smoldering with hate, wanted to kill him, but didn't dare because Herod was in awe of John. Convinced that he was a holy man, he gave him special treatment. Whenever he listened to him he was miserable with guilt--and yet he couldn't stay away. Something in John kept pulling him back. -- That "something" in John is the same something that lives in all who name the name of Jesus. That something is the Holy Spirit who lives and works in us. Praise God!! What would I have on my own merit that could keep the attention of a king? Psalm 39:4-11 Tell me, what's going on, GOD? Oh! we're all puffs of air. Oh! we're all shadows in a campfire. Oh! we're just spit in the wind. What am I doing in the meantime, Lord? But I can't take it much longer. Amen Mike! God is on the throne. He has lifted me from the pit of a "rebel life", but because he did it - not me, I shut my mouth before him except to thank him and bring my offering of praise and worship. Lots going on in today's readings! First, I am not a doctor, but I have been in the healthcare profession for 27 years and considering the fact there was no medicine in those days except herbs (which I'm sure were not plentiful in the desert), the instructions God gives the Israelites is remarkably ahead of the times. Contagious skin diseases did spread rapidly, and the quarentine prevented wholesale infection, unfortunately, the Pharisees and other legalists added many of their own laws to these basic instructions-the basis behind all of Jesus' rebukes to this group. Of course, we have our own Pharisees today doing exactly the same thing-but that is a discussion for another time. Two things jumped out at me today. The first is the story of the death of John the Baptist. I am doing a women's study by Beth Moore called Believing God, and the lesson last week was talking about having faith even when we don't understand what God is doing. She used John the Baptist in a way that really convicted me. To summarize, she asked us to try to imagine what John the Baptist was thinking as he was in jail. He knew that Jesus was the Messiah, and he knew he was the forerunner to Him, can you imagine what he must have thought-wondering why, if Jesus was the Messiah, he was still in prison. He probably had the same expectations that most of the Israelites held for the Messiah and so wondered why Jesus wasn't saving him. This really convicted me because so many times I want God to reveal His purpose to me so that I might understand; and yet, here was a prophet who loved God and was diligent in his obedience whose great faith was even further tested by not understanding the meaning of the Kingdom of God. And I think God will reveal to me-a sinner, a rebel,the proverbial black sheep He has to keep bringing back to the fold? As Beth points out, the wonderful thing about this is that the second the sword hit the rock, God was telling John come sit with me and watch this play out. How wonderful and mysterious are the ways of the LORD. The second thing that jumped out at me was David's psalm today...especially verses 6&7. "6 We are merely moving shadows, and all our busy rushing ends in nothing. We heap up wealth for someone else to spend. 7 And so, LORD, where do I put my hope? My only hope is in you." Does this not sum up our current life experience, or what? Thank you, O Father God, that because of your precious Son and our Savior, Jesus Christ, we can approach You and put all of our hope in You-and You will continue to perfect us until we meet face to face. Amen!